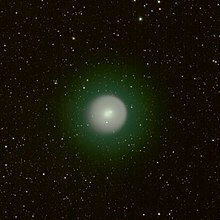 A comet is an icy small Solar System body that, when passing close to the Sun, heats up and begins to outgas, displaying a visible atmosphere or coma, and sometimes also a tail. These phenomena are due to the effects of solar radiation and the solar wind upon the nucleus of the comet. Comet nuclei range from a few hundred metres to tens of kilometres across and are composed of loose collections of ice, dust, and small rocky particles. The coma and tail are much larger and, if sufficiently bright, may be seen from the Earth without the aid of a telescope. Comets have been observed and recorded since ancient times by many cultures. Comets usually have highly eccentric elliptical orbits, and they have a wide range of orbital periods, ranging from several years to potentially several millions of years. I am as familiar with the paths of heaven as with the streets of Nehardea, with the exception of the comet, about which I am ignorant. What you fellows call progress moves by two springs, men and events. But sad to say, from time to time the exceptional is necessary. For events as well as for men, the stock company is not enough; geniuses are needed among men, and revolutions among events. Great accidents are the law; the order of things cannot get along without them; and, to see the apparitions of comets, one would be tempted to believe that Heaven itself is in need of star actors. At the moment you least expect it, God placards a meteor on the wall of the firmament. Some strange star comes along, underlined by an enormous tail. And that makes Caesar die. Brutus strikes him with a knife, and God with a comet. Brian G. Marsden, on the unprecedented brightening of Comet Holmes, as quoted in "Mystery Comet Explodes into Brightness" (26 October 2007) at Physorg.com. Within the space of a few hours between 23-24 October 2007 it brightened from a very dim and obscure object requiring powerful telescopes to see into one easily visible to the naked eye. River that flows now in your veins. Kenneth Rexroth, in "Halley's Comet"
Mark Twain, in Mark Twain, a Biography (1909) Twain died in 1910 when Comet Halley was again visible. But like a comet I was wonder'd at. William Shakespeare in King Henry IV Part 1, Act 3 Scene 2, lines 46-47. Ruling the calm spaciousness of that heaven was the great comet, now green-white, and wonderful for all who had eyes to see. At first it had been an almost telescopic speck; it had brightened to the dimensions of the greatest star in the heavens; it had still grown, hour by hour, in its incredibly swift, its noiseless and inevitable rush upon our earth, until it had equaled and surpassed the moon. Now it was the most splendid thing this sky of earth has ever held. I have never seen a photograph that gave a proper idea of it. Never at any time did it assume the conventional tailed outline, comets are supposed to have. As I drew near the end, the sense of strangeness returned to me. It was more and more evident to me that this was a different humanity from any I had known, unreal, having different customs, different beliefs, different interpretations, different emotions. It was no mere change in conditions and institutions the comet had wrought. It had made a change of heart and mind. This page was last edited on 22 July 2016, at 16:21.